Ron Paul: "There is too much hysteria ... there hasn't been that great a danger"
Some say there are other diseases to worry about: "Malaria is killing thousands"
(CNN) -- As the number of swine flu cases rises around the world, so is a gradual backlash -- with some saying the threat the virus poses is overblown. 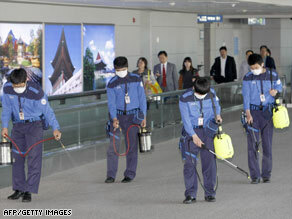 Workers in South Korea, where one case of swine flu is confirmed, disinfect a terminal Sunday at Incheon airport. By Monday, 985 cases of the virus, known as influenza A (H1N1), had been confirmed in 20 countries, the World Health Organization said. The number of fatalities was at 26, including one in the United States. "There is too much hysteria in the country and so far, there hasn't been that great a danger," said Congressman Ron Paul, a Republican from Texas. "It's overblown, grossly so." Paul, who was a freshman congressman during a swine flu outbreak in 1976, said Congress voted to inoculate the whole country at the time. The United States' only death this year from the virus was a 22-month-old boy in Texas who was visiting from Mexico. The other 25 deaths happened in Mexico. "I wish people would back off a little bit," Paul said. Others shared Paul's sentiment, saying the fear of the flu has gotten out of hand. "We have people without symptoms going into the emergency rooms asking to be screened for swine flu at the expense of people with real illness," said Cathy Gichema, a nurse in Pikesville, Maryland. "Schools are being shut for probable causes -- sending these kids congregating to the malls. How is that helping?" Gichema said. "I haven't seen such a panic among communities perhaps ever," Bell said. "Right now, people think if they have a cough or a cold, they're going to die. That's a scary, frightening place to be in. I wish that this hysteria had not occurred and that we had tempered a little bit of our opinions and thoughts and fears in the media." Governments and health officials, however, say the concern is not unfounded. The virus, a hybrid of swine, avian and human flu, can jump from person to person with relative ease. And while most of the cases were reported in Mexico and the United States, some have been confirmed in countries outside North America. On Saturday, the virus strain was found in a herd of swine in Alberta, Canada, and the animals may have caught the flu from a farmer who recently returned from a trip to Mexico. It could be the first identified case of pigs infected in the recent outbreak. "We have determined that the virus H1N1, found in these pigs, is the virus which is being tracked in the human population," said Brian Evans of the Canadian Food Inspection Agency. But Evans and other officials said it is not uncommon for flu viruses to jump from humans to animals, and that it does not pose a risk for consuming pork. The number of pigs infected was not disclosed. In his weekly radio address Saturday, President Obama said the concerns over the new virus are justified because lack of immunity makes it potentially risky. "Unlike the various strains of animal flu that were in the past, it's a flu that is spreading from human to human. This creates the potential for a pandemic, which is why we are acting quickly and aggressively," Obama said. The president, who said the virus is a "cause for concern but not alarm," added the government has anti-viral treatment to treat the current strain of H1N1. In addition, WHO started distributing 2.4 million doses of a common anti-viral drug to 72 nations. iReport.com: How should H1N1 be handled? "I think the world is infinitely better prepared than it was 90 years ago," said WHO spokesman Gregory Hartl, referring to the 1918 Spanish flu pandemic that killed as many as 20 million people. In Mexico, the epicenter of the outbreak, masks have become a common fixture. Nearly half the cases in Mexico involve patients 19 and younger, the health ministry said. "I can hold for maybe another week or two and that's it," said Guillermo Jimenez, a waiter who hasn't worked in a week since the government ordered about 35,000 public venues to shut down. "We don't have any money. We have mouths to feed. I don't know what I'm going to do now." Still, some say the hype over H1N1 has led to undue hysteria. "I'm sure the deaths in Mexico have something do with the infrastructure," said Anthony Markovich, a graduate student in Marina del Ray, California. "I know our health care system has its flaws, but it is more advanced." The world should focus on diseases that have more fatalities, according to Markovich. "This is a joke compared to other things going on," he said. "Malaria is killing thousands of people daily, the economy is not getting any better, it is time to move on." Pakistan resident Faisal Kapadia agreed. "When you put it in context, 700 cases in the world is nothing," said Kapadia, a commodities trader in Karachi. "I understand it is a horrible new disease and governments should find a cure for it, but the media has created too much paranoia." CNN's Emanuella Grinberg and Madison Park contributed to this report.